I predict that the Chief Digital Officer (CDO) will play a vital role at most organizations through 2020, but the organizational role will be fleeting as a standalone. “Digital” will integrate all functions and be the standard eventually, but organizations require intense transformation to get there, so the CDO will play a crucial role. My ongoing analysis of social business adoption indicates that the market for social business transformation will hit an inflection point by 2017, as more advisors and executives see the power and results of digital communications and collaboration. The Chief Digital Officer is a powerful locus of attention, but current thought leadership reveals a lack of clarity about “digital” and the CDO role; moreover it unknowingly discounts the transformational potential of social business, both of which I’ll address here. Gartner’s Mark McDonald proposed four “types” of CDOs as defined by revenue accountability and organization. He made the excellent point that the “digitization” process will vary with the type of organization, how it currently uses digital technologies and what kind of business it is/how it generates revenue. Here I’ll touch on Mark’s model for four types of CDO before suggesting how each can best use social business for organizational transformation. The “often used by” parts are my interpretation. I encourage you to read Mark’s post. Focus: driving new and incremental sales/ecommerce revenue from digital technologies; runs the digital part of a business/brand with revenue accountability. Often used by: organizations that have significant digital operations that they want to expand in depth, breadth or both. Focus: disrupting a business/brand from the inside, using digital technologies, processes and programs to create new capabilities, often within a new digital unit. Often used by: any business/brand that wants to disrupt itself from the inside. Focus: driving new and incremental marketing/promotional revenue through other business units; uses digital technologies to create new customer experience, and has revenue accountability. Often used by: organizations that have significant digital marketing operations that they want to expand in depth, breadth or both. Focus: disrupting the enterprise from the inside, using digital technologies, processes and programs to create new capabilities. Often used by: enterprises that want to disrupt themselves from the inside. There is broad consensus that “digital” encompasses four competencies: mobile, social, ecommerce and big data/analytics. Of course, the relative importance of each competency will vary with type of organization and the business it’s in, but I’ll argue that social, since it digitizes communication and collaboration, is the most broadly transformational competency. All organizations depend on communication and collaboration to create value, and digital social has shrunk the cost of both by an order of magnitude. Few organizations have discovered how to reorganize to unleash the power of much faster, cheaper communication and collaboration, which has kept social off the radar so far. Since very few analysts, consultants and executives have seen digital social transformation from the inside as I have, thought leadership underweights social. Of course, by “social,” most authors assume “social media,” which is far less transformational than social business; social media simply uses social technologies as a new channel for content distribution, promotion and marketing. That is evolutionary, not revolutionary. By prioritizing transformation and disruption, we can shrink Gartner’s four types of Chief Digital Officer to two, and I’ll propose that their differences won’t often matter in practice. By prioritizing transformation and disruption, we can shrink Gartner’s four types of Chief Digital Officer to two, and I’ll propose that their differences won’t often matter in practice. I’m not saying that the others don’t matter—all will create intense value for various organizations—only that transformation makes two of the four most relevant. Of the four digital competencies, ecommerce, mobile and analytics are already part of digital operations at many companies, so many CDOs will be necessarily focused on evolving, scaling and managing digital operations. Their charters will be repositioning digital within the organization, making it more strategic and powerful relative to other capabilities. Any of these three competencies can drive profound transformation of organizations, depending on their business and current use of the competencies. However, the “social” competency, since it refers to social media, addresses transformation superficially at best. Organizations aren’t even in the social business transformation ball park. Moreover, social business, since its transformation journey involves discovering, engaging and scaling new relationships with customers, clients, partners, employees and other stakeholders, requires a significant learning curve. Its value is grounded in relating to stakeholders in new ways, not technology skills like big data or analytics. Social has the most profound disruptive potential of the four digital competencies when it is approached as social business. This CDO adds clarity and scale to existing ecommerce, mobile and analytics operations, whether marketing-oriented or sales-oriented—at the enterprise or business/brand level. This type corresponds to Gartner’s Chief Digital Revenue Officer and Chief Digital Marketing Officer. Depending on the business and its experience with digital prior to hiring a CDO, any of the four can be pivotal. Social business can be profoundly transformational in any business. 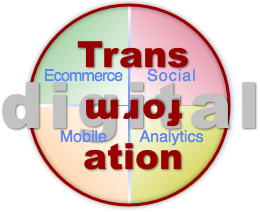 Ecommerce: CDO focuses on integrating social and mobile, mcommerce and analytics to grow the ecommerce/mcommerce business. Growing digital will be pivotal to enterprises whose non-digital businesses are shrinking. Mobile: can revolutionize sales, service and even product/service development, depending on the business. Discover, experiment and scale how to engage smartphone-enabled stakeholders. Big Data/Analytics: most organizations have been collecting digital data for decades, but new technologies are enabling them to knit data together and derive new insights into demographics and individuals. The first level of value is often creating and delivering more “personalized” marketing and sales messages. Social: can be approached as social media, as it is currently at most organizations, or social business. Many brands already have significant social media operations. The Upgrade Social Media use case details how to mature social media into transformational social business. The Herd the Cats use case shows how to improve business returns of several business units or brands. This CDO has an explicit transformation/disruption focus at the enterprise or business/brand level. It corresponds to Gartner’s Chief Digital Champion Officer and Chief Digital Strategy Officer. Gartner’s model specifies that these types “transform” the organization. Reading into the context, I’ll hazard that each of these CDOs uses social technologies to transform passive, isolated relationships with stakeholders (customers/clients/users, partners, regulators, employees, communities…) to active collaborative relationships. As I proposed in the Transform the Enterprise use case, explicit social business transformation operationalizes through a Social Business Competency Team under the CDO that builds social business competencies iteratively and spreads them throughout the enterprise via mentoring. Therefore, whether the CDO is housed at the enterprise level or within a business unit matters little. Any organization that explicitly approaches social business as transformation will not keep it within any business or brand because it is so fungible. Using the SBCT and transformation approach enables organizations to begin transformation anywhere and achieve enterprise transformation as a function of conditions and results. They should begin social business transformation in the optimal part of the organization, where stakeholder adoption is highest and organizational resistance is lowest. My experience advising global businesses on social business strategy and execution consistently shows that, when organizations use a relationship-focused approach, they create new opportunities to reinvent themselves from the ground up. When they learn to use social technologies to discover, create and scale trusted relationships with stakeholders, collaboration and innovation increase sharply. These drive profit. Therefore, it follows that It will be more difficult for CDOs to transform businesses or enterprises with social business when they have significant operations management accountabilities. Transforming with social is complex and not a part-time job because it is often disruptive, and the CDO will need to orchestrate transformation so s/he creates new profit without negatively impacting legacy revenues in the meantime. It will be more difficult for CDOs to transform businesses or enterprises with social business when they have significant operations management accountabilities. Transforming with social is complex and not a part-time job. Here are general recommendations for how each type of CDO can use social business for transformation. All refer to the Social Business Life Cycle. Focus on transforming your brand’s/business’s vision for “customers” or “clients” by using social to learn about the outcomes for which they buy your product or service. Strategy will provide the basis of your social business strategy, which will call for several social business pilots to test the strategy and start developing your team. As you learn about their outcomes, evolve your messaging from product-centric value propositions to customer outcomes, and engage with customers around outcomes. This will usually involve realigning many functions because their DNA is product-centric, and they have promotional attitudes. As your internal social business capabilities grow, consider “taking back” social media operations you have outsourced to your agency(ies). Opportunistically tone down promotional messaging and attitudes toward customers, and morph to a more collaborative stance. If you are having some success with mcommerce, mobile social and social media, continue these initiatives while you are evolving your customer/client relationships. More information in Building Post Product Relationships in the Social Channel. Use the Upgrade Social Media use case to begin evolving social media into social business in order to boost revenue and transformational potential. If you are in a business that has lagged its peers in social media, use the Catch the Leaders use case. Begin transforming your business/brand from the inside by developing a holistic view of stakeholders; they might be clients/customers, channel partners, employees, contractors or other influencers. Ground your stakeholder understanding in their outcomes, which govern why they work with you (partners) or buy your product or service. Conduct Feasibility, Strategy and Pilots to develop insight and build your SBCT iteratively or upfront. The key to mitigating the risk of transformation is developing repeatable processes with real business results as quickly as possible, scaling them and finally unplugging legacy processes when feasible. Transformation will enable you to redesign many of your business processes and harness new types of collaboration with stakeholders. This will lead to new sources of open innovation and profit. Depending on your CEO’s sense of urgency, use Herd the Cats (if your business has several social media initiatives already) or Transform the Enterprise use cases. You will find Catch the Leaders helpful if your firm has had minimal social media experience. Focus on transforming your enterprise’s vision for “customers” or “clients” by using social to learn about the outcomes for which they work with you or buy your product or service. Strategy will provide the basis of your social business strategy, which will call for several social business pilots to test the strategy and start developing your team. As you learn about their outcomes, evolve your messaging from product-centric value propositions to customer outcomes, and engage with customers around outcomes. Consider the social business model, “Service as Marketing,” in which you collaborate with “customer service” to solve problems in public and commingle the solutions with product/service information. Consider the Digital Events social business model, which reinvents physical events such as festivals, trade shows, conferences or symposia. Use the Upgrade Social Media use case to mature social media, or Catch the Leaders if your business is far behind, or Herd the Cats if your enterprise has numerous social media initiatives whose revenue contribution you want to increase. Begin transforming your enterprise by developing a holistic view of enterprise stakeholders and social business adoption across your enterprise and its businesses/brands. Stakeholders might be clients/customers, channel partners, employees, contractors or other influencers. Conduct Feasibility, Strategy and Pilots in the enterprise context to develop insight and build your SBCT. Launch the SBCT as early as feasible. Ground your stakeholder understanding in their outcomes, which govern why they buy your product or service. When your SBCT has run 3-5 pilots, evolved the social business strategy, built their digital collaboration space and developed some social business competencies, opportunistically engage one of your businesses/brands that Feasibility found to have high social business potential, as a function of its stakeholders’ social business adoption. The key to mitigating the risk of transformation is developing repeatable processes with real business results as quickly as possible, scaling them and finally unplugging legacy processes when feasible. In this case, you are scaling enterprise social business (with the enterprise as client) as well as across your businesses/brands. Transformation will enable you to redesign many of your business processes and harness new types of collaboration and innovation with stakeholders. See the Transform the Enterprise use case for more information.